Our holidays and short breaks are designed around you. We use our intimate knowledge of the Cotswolds and local connections to tailor your break to your needs. Based in Kingham, in the heart of some of Britain’s best cycling country, we plan our routes to take you through stunning countryside along hidden lanes and by-ways in Oxfordshire, Gloucestershire and Warwickshire. We will guide you to a host of historic towns, country houses, castles, gardens and cultural events that will give you a real sense of connection to the largest Area of Outstanding Natural Beauty in England. We start by finding out what you want from your guided holiday or short break and then create tours that are designed around you. Our hub is the beautiful Mill House Hotel in Kingham, conveniently situated within a mile from Kingham railway station, only an hour and twenty minutes from London Paddington (transfers to and from the station are free and part of our service). Set on the edge of the village amidst its extensive grounds with mill stream, the recently refurbished hotel is family run, offering a relaxed and friendly service. All our prices include a full breakfast and delicious three-course evening meal in the popular restaurant. Having the right bike and equipment is an essential part of a cycling holiday. Secure cycle storage, cleaning facilities and lubricants are available to our guests based at the Mill House Hotel who wish to use their own bicycles. We also hire good quality hybrid bikes, locks and helmets and include a bike fitting to ensure that the geometry of the bike you hire is correctly adjusted for maximum comfort and safety. Our over-night laundry service helps you keep your favourite cycling kit clean and in tip-top condition. We can also supply a wide range of quality cycle clothing for you to buy if you forget to pack a vital piece of kit! Our circular routes, starting and finishing at Kingham, are individually planned to suit you, whatever your level of experience or ability, whether keen club cyclist or a family group. Every booking starts with a conversation – our aim is to find out what you want from a bespoke cycling tour and to ensure that the arrangements we make for you meet your expectations. 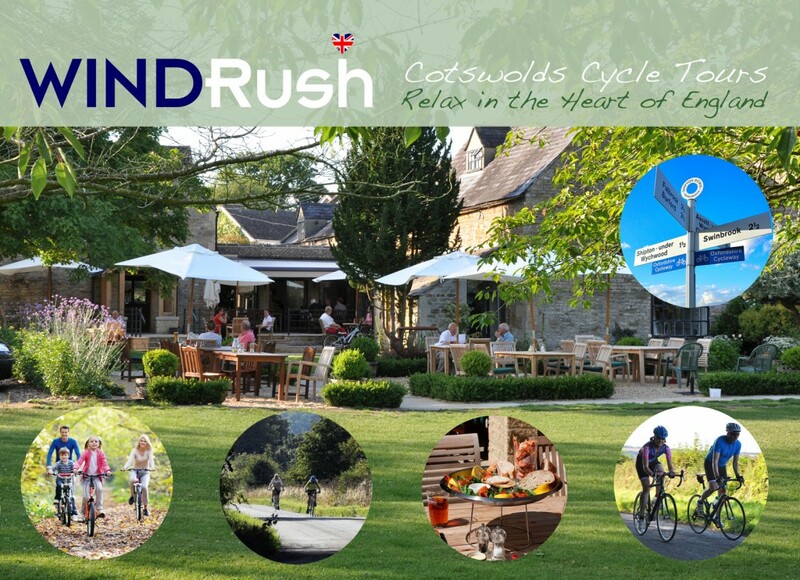 As well as planning your rides to lead you through the iconic landscapes and historic towns of the Cotswolds, we build in an itinerary linked to the many and varied cultural events which take place throughout the year. The challenging topography of many of the rides is suggested by the name of our location “The Cotswold Hills”- there are flatter routes through the Windrush and Evenlode valleys, but, as some climbs are inevitable on most circuits, it is important that children in groups are competent, traffic aware and confident cyclists. And remember what goes up . . . can also enjoy a relaxing or thrilling downhill descent. All the circuits from Kingham take quiet back roads and beautiful country lanes – carefully chosen to allow you to enjoy the tranquility of the countryside. We also include a cyclist’s most treasured secret – cafes and tea-shops en-route! To fuel the more energetic cyclists we can offer a range of isotonic drinks and gels. Finding your way around is easy. To remove the potential anxieties of navigation, our fees include the hire of a bike SAT-NAV. These enable us to program routes precisely matched to your interests and abilities, giving you the confidence to explore the very best routes away from main roads. 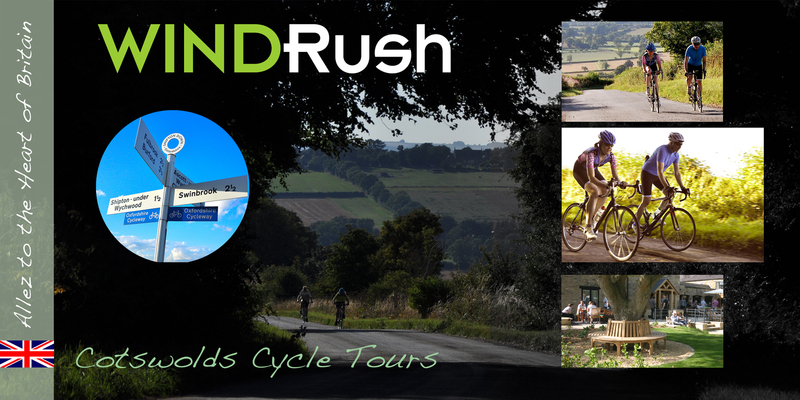 We also offer guided rides by arrangement, which provide excellent value, especially for families or groups. For ultimate peace of mind, we also offer a road-side call out service to all our guests, plus the services of a mobile bike mechanic to ensure that you can enjoy a worry-free break. - and Garmin hire* (*a refundable deposit is required).